News Archives | ROSS s. r. o.ROSS s. r. o.
Ross produced a promotional light pylon for the Atrium business center in Bratislava. The 10-meter pylon captures the customer with a modern timeless design. The strength of the pylon is secured by a steel construction with powder coated surface finish and a dibond shell. The logo is highlighted by bright LED modules. Large pylons like this are mainly designed for brand presentation. Smaller pylons are more informative. An almost two-meter high pylon at the shopping center parking area provides customers with all the necessary information they need. Thanks to LED backlight, the information is well visible. Take a look at your business, engage, inform, or navigate. Inspired by our product range? You can find, among other things, both illuminated and non-illuminated pylons. Do you want to take part in exhibitions or presentations and encourage your customers with a unique presentation bar designed tailored just for you? For our customer, we designed and manufactured a portable SpiritPlanet presentation bar, which can be found at various HORECA conferences. It presents a portfolio of premium spirits, wines and coffee. On the front is a stylized font with logo. On the back wall there is a light-coloured logo along with backlit shelves that highlight luxury spirits. Applying our long-term experience, not only in the field of material processing but in terms of the recognition of the demands for reliable functionality, we have designed the equipment The bar-presenter. In spite of the efficient and minimalist design, it provides the operator with sufficient storage space for ice cans, herbs etc. Everything of course is ergonomically positioned for maximum operator convenience. The bar is simple to assemble and dismantle for easy transportation to the next site. The main point is customer service coupled with an expressive presentation element which meets all the requirements of the device. The design is characterized by a simple and fast installation which is not required to be carried out by specialized team. The regular shelf, which is part of every supermarket, can be edited into an impressive and original presentation within minutes. With this display we also participated in the international competition POPAI awards 2018. The display is intended for the presentation the beer Golden Pheasant ’73. The aim of this project was to point out a beer inspired by the oldest preserved brewer of beer Zlatý Bažant from 1973. That is why the idea of presentation in a retro style was created. The recesses provide illustrations, colour and an old phone with a rotating dial from the same era. Backlit items underline the overall effect of the display. The Vaprio Promotion Set is an original combination of three products: a presentation rack, a product of the day display, and a candy bowl. Besides design, the fruit flavoured Crazy Vape products are backlit which attracts the customer’s attention to the goods. The lockable light box is designed to expose and draw attention to the product of the day. Handling of the goods is very simple. You can find it at the sales counters in the store. The whole set is completed by an unusual bowl of fruit candies in a checkout zone that points to the sweet fruit fillings. At the same time, it helps to complete an overall content feeling while shopping. The product set is located in the Czech and Slovak Republic’s stores. The concept of the Promotion Set is characterized by its original design and the encouragement to an impulsive purchase. Ross are involved in another interesting project. 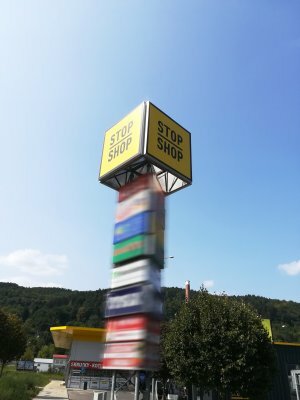 The Austrian company STOP SHOP, the retail park brand in Central and Eastern Europe, have chosen us as an exclusive supplier of new brand names for branches in Slovakia. 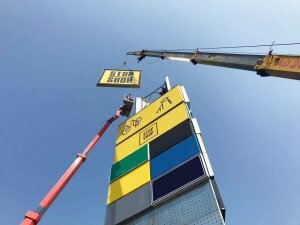 This exceptional realization is not only in the large dimensions of the sign and illuminated area, but also in the transportation logistics and the complexity of the rebranding in the short time given. This can only be achieved with full technological equipment and a flexible planning and production capacity. The complexity of this project did not deter us. We have to carefully plan work with oversized ads in front of shopping centers that we place at height on pylons in public places. The installation of both illuminated and non-illuminated commercials which are carried out at heights therefore increases the mounting intensity and requires a different lifting technique. It is necessary to always optimized according to the given conditions during such an operation. Customer-oriented shopping centers offer a variety of services, such as green playgrounds, children’s centers, restaurants and much more. That’s why we produce signage for STOP SHOP that are well visible and understandable. How to create an original rack that will present products for dogs and attract the customers attention so much that will lead them to buy? Even complex assignments like this are a welcome challenge for Ross. 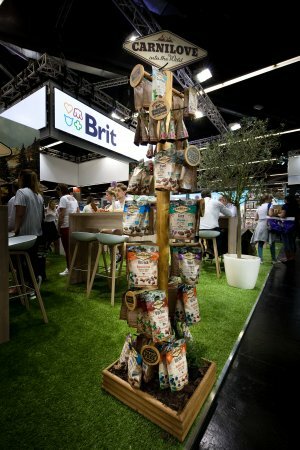 By combining natural materials, our company Ross succeeded in achieving the unique design of the Carnilove display. The original version allows the seller a simple categorization of goods, making it easy for customers to make decisions about purchasing their pet products. Advantages of the rack are mainly simple handling and fast replenishment. 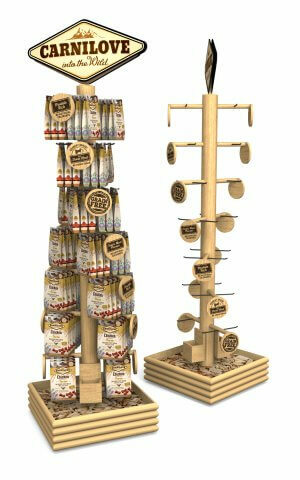 The stand easily adapts to changing the products offered by replacing labels. At the bottom of the display are holders for information leaflets.